The principle of selective thermolysis can be applied towards the removal of tattoos. The energy delivered by a number of different lasers is targeted towards the carbon particles or dyes that are found in skin tattoos, allowing selective destruction of the foreign pigment while minimizing damage to the surrounding skin. Lasers may be used on professional, amateur, cosmetic, medicinal, and traumatic tattoos. The different colors present in the tattoos may respond differently to laser tattoo removal. Lasers offer a non-invasive and effective treatment for unwanted tattoos. Q. How Do Lasers Remove Tattoos ? The laser device fragments the ink with short pulses of intense, concentrated laser light. The method of delivery and the wavelengths used are designed to target only the tattooed pigments, without affecting the surrounding pigments and layers of skin. Different laser lights are used for different ink colors. Black ink is easiest to remove, because black absorbs the full spectrum of light, while green, blue, red, and other colors require more targeted laser pulses. Passing through the surface layers of your skin, the light is absorbed by the tattooed pigments, causing them to break into smaller particles. Your body's immune system then removes the fragmented tattooed particles. And because your immune system works best in areas of greater blood circulation, ink can be removed faster in those areas. Thus, it's more difficult to remove tattoos in the hands and feet, where there is less circulation. Tattoo removal may require anywhere from one to ten laser treatment sessions, each treatment lasting only a few minutes, with four- to eight-week intervals between each session. Each treatment penetrates a little deeper, removing more ink and leaving the tattoo progressively lighter. Q. Who is a candidate for Tattoo Laser Removal ? Anyone with an undesired tattoo is a candidate for laser tattoo removal. Most tattoo colors can be eliminated or lightened to a large degree. However, skin colored tattoos may undergo irreversible ink darkening. This is seen with some white, pink, flesh-toned and light brown tattoo inks. Red ink tattoos may turn black. A test dose is a good idea in these situations, and the tattoos may be improved with subsequent laser treatments. Q. How many treatments are necessary for tattoo removal ? Tattoos require multiple treatment sessions, usually performed at 4-8 week intervals or longer. Tattoo lightening may continue for several months after the last treatment session. Amateur black tattoos typically respond better than professional tattoos. This laser emits a red light that is well absorbed by most amateur and professional tattoo ink colors except red and yellow. Dark blue and black inks respond best. The response of green tattoos is variable. Excellent results are observed, especially with amateur black tattoos. Amateur tattoos respond in fewer treatments compared to professional tattoos. The QSRL is also effective in treating medicinal and traumatic tattoos. This laser is effective for both amateur and professional tattoos of all colors. Like the ruby laser, the Q-switched Nd:YAG is most effective for black tattoos. This laser has the advantage of being useful for darker skinned individuals. At the frequency doubled setting (532 nm), the Q-switched Nd:YAG is highly effective for treating red and orange tattoos. The Q-switched Nd:YAG laser at 1064nm can cause more pain, and a higher degree of textural changes to your skin than the QSRL. This laser is comparable to the QSRL when it is used to treat tattoos, particularly when treating green tattoos. Up to 50% of patients can experience textural changes in their skin after treatment. With a wavelength of 510 nm, this laser does not penetrate into the deeper tattoos. However, it is effective for the treatment of brightly colored tattoos such as those that use red, purple, and orange inks. The major side effect of this laser is bruising. An antibacterial ointment and a dressing will be applied to the area immediately after treatment if necessary. Occasionally, there will be pinpoint bleeding associated with the treatment. The treated area should be always kept clean. Follow your physician's instructions exactly as to what to do during the days following the procedure. A shower can be taken the next day, although the treated area should never be scrubbed. If a scab forms it is vital that you do not pick it or scratch it, and a scab should never be removed prematurely. In many cases it will. Often greater than 95% fading of the tattoo may be accomplished. However, it is important to know that there are many, many types of tattoo inks in use worldwide today, none of which are regulated by the FDA. Not knowing which tattoo ink was used, or how deeply it was applied, makes it impossible for the physician to predict the degree of removal on any given tattoo. Lighter skin tones have a higher success rate. Most tattoos are significantly reduced in appearance after the first session. Black, red, dark orange and dark blue tattoos will usually respond relatively quickly to treatments. Green and light blue colors are often the hardest to treat and may require more visits or not respond as completely to treatment, other colors are somewhere in-between for difficulty. 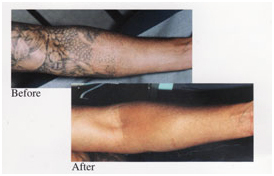 The laser provides maximum tattoo removal while leaving the surrounding skin unharmed. Occasionally, pinpoint bleeding may be associated with the treatment. Q. Is Laser Tattoo removal painful ? That depends on your pain threshold. When a lower fluence is used, the degree of pain is often described as comparable to that of a rubber band snapping against the skin. You may need local anesthesia with higher fluences. This will eliminate any discomfort during the procedure. A topical anesthetic cream (such as EMLA®) or the infiltration of the surrounding skin with lidocaine may be necessary. Q. Will there be any scarring ? Laser treatment in this case will deal with the skin's pigmentation and does not cut through or harm the delicate surface of the skin. Any scarring therefore would be of an absolute minimum but they may appear some pigmentation changes. Hypo-pigmentation, loss of pigment, and hyper-pigmentation, excess pigment, may be apparent after treatment but this can be expected to fade and normal skin tone should return after 6 months.